Thank you to Cottonelle for encouraging me to Respect The Roll by sending me these awesome roll covers and Cottonelle Clean Care product and sponsoring my creativity. You can enter to win roll covers yourself by visiting Cottonelle's Facebook page! I don't know about you, but I have struggled with the dilemma of how to have extra rolls of toilet paper handy for my guests (and myself, for that matter) without having to display them for the world to see. 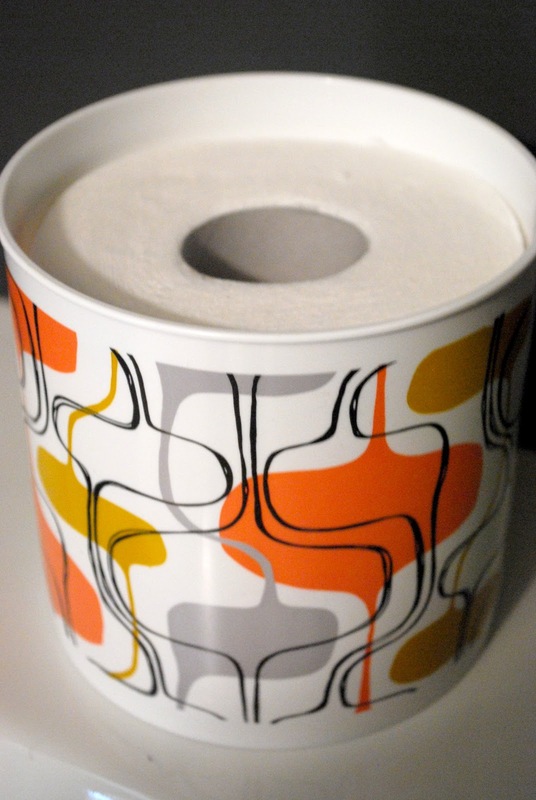 Because, lets face it, important thought it is, toilet paper is not exactly designer friendly. Until now, that is. The good people at Cottonelle have come up with an idea. They call it "Respect the Roll". I call it "smart". Check out these cute roll covers that they have created. They raise the lowly toilet paper roll from merely mundane to the almost artistic. Seriously, what a great way to keep those rolls out in the open. They look great just sitting atop the commode. You can leave them alone, or have a little bit of fun and stack them like I have here. But why stop there? Check out this fun little display in my guest powder room. I just grabbed a plate stand from the kitchen (I love using items in unexpected places...rethink the obvious, I always say.) I love how the colors play off my dark gray walls...it adds a little bit of punch! And, of course, the containers are great for other storage uses as well. Check out this little cutie coralling our hair goo and such. What a great idea, huh? Or you could use them in other rooms in the house to store art supplies, goodies, all kinds of things. With the great contemporary designs and color combinations they would adapt easily to just about any room in the house. 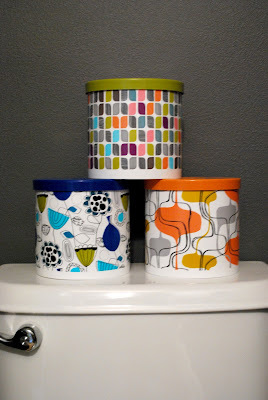 But for now, I think I'll use them for their intended purpose - three bathrooms in this house - three cutie pie roll holders. Just popped a roll of Cottonelle Clean Care toilet paper in each, and now we're ready just in case someone needs 'em. Oh I love love love this! Where do you get those little cutie pie things at? What a great idea..I have never seem these before..Have a great week..